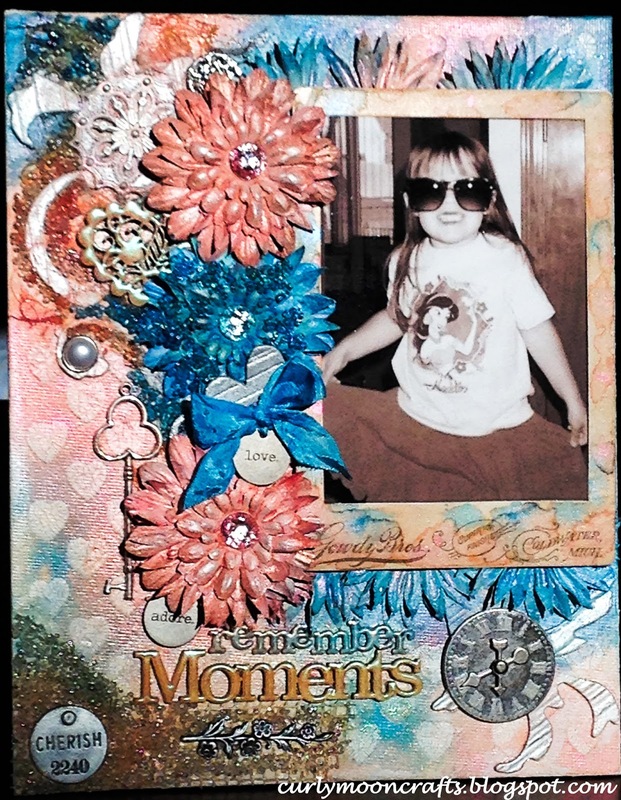 Hi Friends: Today's post is a mixed media canvas of my daughter when she was about 5. I love this picture and wanted to add it to a layout and decided that a canvas would be the perfect format. Please see below for photos, process, and supplies. Have a super day! I started with a blank 8X10 canvas. I used crackle paste and a stencil to add the hearts around the canvas. Once dry, I added some Grungeboard swirls to the canvas and covered them with white gesso and let that dry. I tucked some cheesecloth around the swirls for some added interest. 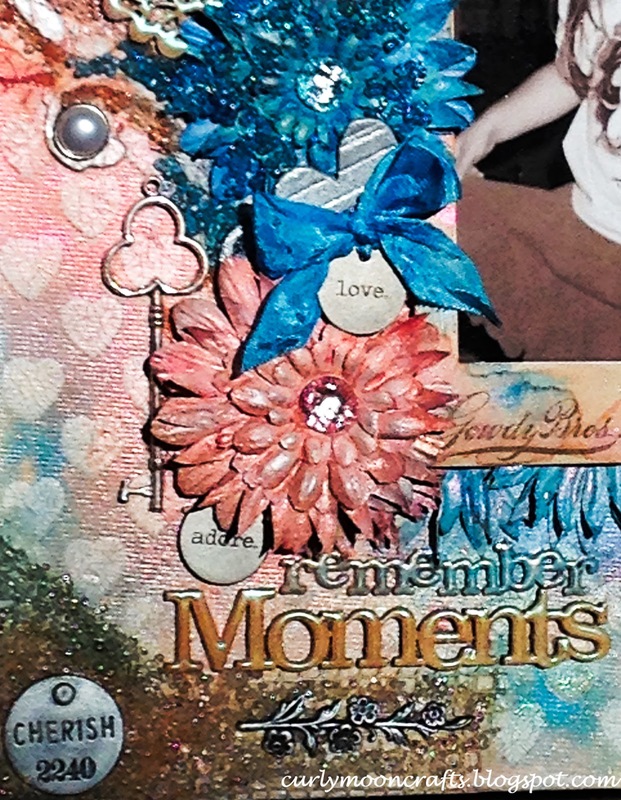 Next, I got out some of my favorite LSG sprays and colored the background with lots of shimmery color. I grabbed several flowers from my stash, covered them with gesso so I could change the color, then sprayed them with the same LSG sprays. The main flowers are topped with some shimmery foils. I covered the Cabinet Card Frame with clear gesso, dried it, then colored it with the LSG Magicals and added the photo. I used some spare cardboard to lift the picture on the canvas, then tucked the flowers in and around the frame. For the wood title and heart, I used Versamark ink and embossed them with the LSG embossing powders to match the colors on the canvas, then glued them in place. 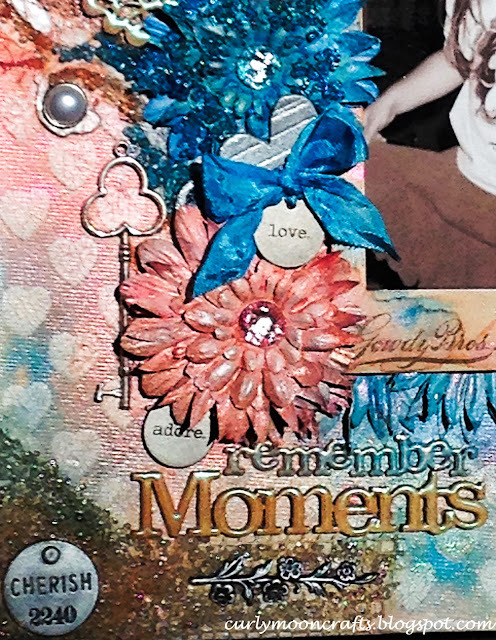 I added the charms, metals, jewelry pieces, brads, and other embellishments. To alter the color of the top jewelry piece, Philosophy Tag (Cherish), and the swirls, I rubbed them with silver Inka Gold and buffed the color to a nice shine. The Grungeboard heart was painted with silver 3-D stamp paint and tucked between some flowers. 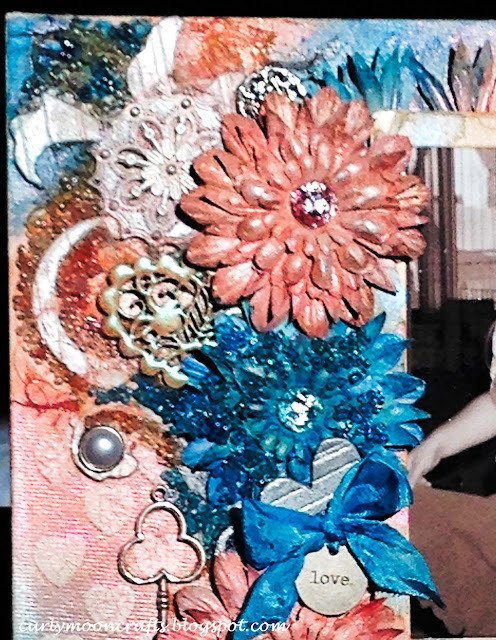 I colored the crinkle ribbon with the Blue Hawaiian Blue LSG spray, added another token, and glued it on top of the heart. I added some metal mesh to the bottom left corner, then I was ready to add the seed beads around the swirls, the center flower, and the bottom corner, over the mesh. For highlights on the flowers, instead of using gesso, I rubbed a bit of the inka gold on them. This project was lots of fun - I love the shimmery sprays and seed beads!